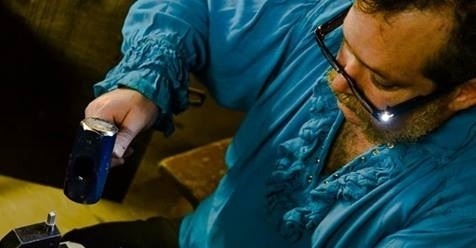 Fernando's Engravings is a hand engraving company that specializes in the engraving of stainless steel rings and other objects like pendants and dice. Unlike many other ring engravers, we have gone down a different path: we engrave in Futhark (language of dwarves), Tengwar (lower elvish), Draconic (language of dragons), Old English, ABC's,Viking and Viking Elder, Old High Gallifreyan (Doctor Who) and Aurebesh, Star Wars Galactic Basic. We have also sourced almost all historic viking runes that don't have an attached alphabet.